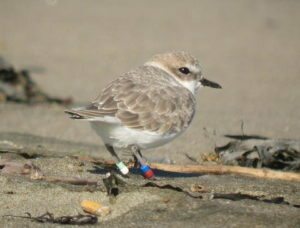 Golden Gate Audubon is participating in the range-wide recovery effort for the Snowy Plover, a federally threatened species that lives within our coastal beach areas. These pages are a resource for information about the Snowy Plover and for fostering community-based stewardship of our local seashores. Our objective is to support the Snowy Plover recovery effort for habitat areas within San Francisco County, as prescribed in the U.S. Fish & Wildlife Service recovery plan. We also aim to provide opportunities for San Franciscans to participate in the stewardship of our coastal ecosystems, and to support the National Park Service in achieving a sustainable management strategy for the Snowy Plover and its seashore habitats. The Snowy Plover (Charadrius nivosus nivosus) was once common along the west coast of the US from Washington to Baja. As human population increased over the past century, shoreline development and recreational uses have contributed to habitat destruction and degradation, resulting in dramatic population declines of this small shorebird. Reaching critically low numbers, the Pacific Coast population of the Snowy Plover was listed as threatened in 1993 under the Federal Endangered Species Act. Snowy Plovers live on flat, sandy beaches and sand dune areas that offer ample food sources and provide safe roosting opportunities. Their diet consists of small invertebrates that can be picked from the surface of the sand, from low-growing vegetation, and from surf-cast marine debris such as kelp. When not feeding, Snowy Plovers roost in small depressions in the sand or on the leeward side of objects such as driftwood, kelp, or dune vegetation. Some Snowy Plovers remain in their breeding areas year-round while others disperse up and down the coast to spend the non-breeding season at other locations. They rest and feed in these wintering areas for up to nine months of the year, building up the fat reserves they will need to migrate and to endure the breeding season. Snowy Plovers are gregarious, foraging and roosting in loose flocks, and often associating with other species of small shorebirds. Snowy Plovers continue to face adverse conditions that threaten the population’s recovery. In breeding areas, the most serious threats are those that contribute to high rates of nest failure and chick mortality. In wintering areas, Snowy Plovers face threats from frequent disturbances that can disrupt caloric accumulation and result in diminished migration and breeding success, and from habitat degradation due to natural and human-influenced causes. Because Snowy Plovers live in areas that are also popular locations for human recreation, there is often the potential for frequent disturbance. Recreational activities such as jogging, dog walking, ball games and kite flying are common sources of disturbance. There are natural sources of disturbance too, such as crows and ravens that are attracted to human refuse. The U.S. Fish & Wildlife Service has developed a recovery plan for the Snowy Plover that emphasizes management on Federal and State lands, and includes strategies for successful stewardship of coastal habitat areas. With cooperative efforts at Federal, State and local levels, and with support from rangewide coastal communities, it is hoped that the Snowy Plover population stabilize and recover. Through good stewardship of our seashore areas, we can meet both human recreational needs and the survival needs of wildlife. Managing some seashore areas as passive recreation areas can greatly reduce disturbance to shorebirds while providing recreational opportunities such as walking, beachcombing, wildlife viewing and photography. Some of the issues currently faced by the Western Snowy Plover at Ocean Beach are shown in this KRON Television story by Stanley Roberts.